Members of World People’s Resistance Movement from Britain and Ireland conducted this interview in Nepal. WPRM: Can you introduce yourself please? Com. Binod: My name is Comrade Binod. I am a Central Committee member and secretary of the state council for Mahakali state, which comprises seven districts in the far west of Nepal. WPRM: Can you tell us about the recent Central Committee meeting and its implications for the coming weeks and months? Com. Binod: In the life of the party, this Central Committee meeting has been unusual from the point of view of ideology and debate. We have received an opportunity, and we are proud that this meeting has been very unusual because it has taken place amid the deep curiosity of the proletariat in Nepal as well as the world over. This curiosity is positive. At the same time, the imperialists and reactionaries also have an expectation. Amid this we have carried out a great meeting, and made decisions which have made us proud to talk about this meeting. WPRM: And what are these decisions? This article was published on eKantipur.com. Thanks to Comrade Alastair for posting it on RevLeft. GANESH CHAUDHARY TIKAPUR, Aug 20 – Supporters of the UCPN (Maoist) are yet to return to the rightful owners the land and houses they seized in Kailali district during the decade-long insurgency, despite the Maoist leadership’s oft-repeated commitment to the handover of the captured assets. Statistics of the District Administration Office, Kailali, show that Maoist activists captured land and houses of 430 individuals in the district during the insurgency. 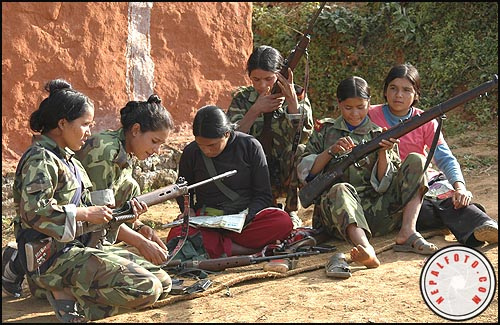 Poor people and families of Maoist fighters killed during the insurgency have been making use of the assets. This interview was published in Telegraph Nepal. What are the conclusions of the freshly concluded Central Committee meeting? Could you throw some light on that? Comrade Kiran: We are now a part of the ongoing peace process. Our prime objectives are the conclusion of the peace process with a positive note, to successfully accomplish the task of PLA-Nepal Army merger and drafting of the constitution on time. This article was published in Telegraph Nepal. The original title of this article is obviously speculative and should be viewed with care. Thanks to Comrade Alastair for posting this on RevLeft. 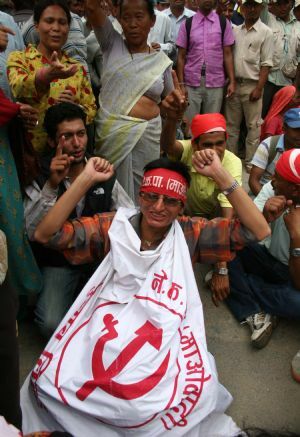 The Unified Maoists’ Party Led ‘United Revolutionary Front’ (URF) has vowed to further intensify its sadan and sadak (Street and parliament) centric protests aimed at restoring civilian supremacy and also form a parallel government. Currently, Dr. Babu Ram Bhattarai, the Maoists’ Party vice president is heading the 175 member Revolutionary Front. 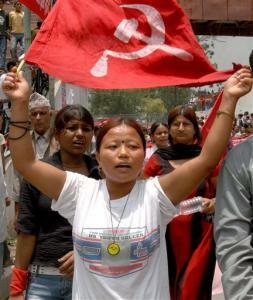 The Maoists party on Wednesday, August 19, 2009, formed a Sub-committee ‘Samyukta Rastriya Janaandolan Nepal’ to carry out its objectives. This article was published in Telegraph Nepal. “Revolt is not for pleasure however, the situation is such that we are forced to take on to the path for yet another revolt”. Kula Prasad K.C. alias Sonam, the Unified Maoists Central Committee member and the YCL Central in charge, made this grand disclosure while addressing a program in Tamghas of Gulmi district and stated that the Maoists’ Peoples’ Liberation Army was kept on high alert. Mr. K.C. was inaugurating the YCL Gulmi First District Convention wherein he made this tantalizing disclosure. He also told the Maoists’ cadres that the Party was preparing for revolt and that the new revolt will ensure rights of the people that is long overdue. 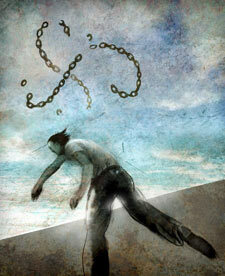 This this was written by Banned Thought and is an introduction to a series of articles collected and posted on the site. Many thanks to those folks for taking the time to put this great resource together. 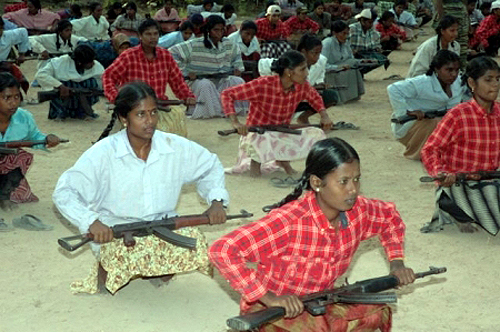 Starting in November 2008, the tribal people (or adivasis) of the Lalgarh village area of the Midnapore district of West Bengal, India, rose up against decades of oppression and abuse by the police and armed thugs of the Communist Party of India (Marxist). This party is usually known by its initials as the “CPM”. Despite its name, this is by no means a revolutionary Marxist party; it is instead a revisionist or phony “communist” party, which represents not the workers, peasants and the poor, but actually the ruling alliance of exploiting classes (capitalists and landlords). The CPM has been in power in West Bengal for decades, and has come to demonstrate that old revolutionary Marxist addage that revisionism in power is nothing other than outright fascism as far as the masses of people are concerned. Naturally the people of West Bengal are more and more resisting this state oppression, but when a revolt like that in Lalgarh occurs, the CPM police and armed goons become all the more ferocious in their attempts to suppress the people’s upsurge and drive them back into submission. There are now huge numbers of state police and paramilitary forces in the Lalgarh area attempting to put down the people’s revolt. But the mass struggle is continuing! This article was published in People’s Truth #7. Thanks to Banned Thought for making it available. Part 1 appeared here yesterday. Since the beginning, the Indian government always intervened in Sri Lanka keeping its expansionist interests in mind. While paying lip service to the plight of Tamils the Indian government extended tacit support to the Sinhala-Buddhist chauvinist ruling classes. In 1949, after the Sinhalese ruling classes assumed power, it colluded with them in disenfranchising the plantation workers of Indian origin and agreed to promulgate the Citizenship Act 1949 that made more than a million Tamil plantation workers stateless. 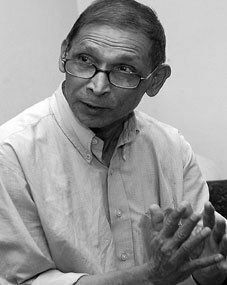 In 1971, when the Sirimao Bandaranaike government was in imminent threat from the JVP uprising, the Indian government provided all help to quell that rebellion because it did not want to lose its prominent status to China in Sri Lanka. Again in 1974, for the same reason, it ceded Katchattivu, a fishing island port of Tamil nadu from time immemorial, to Sri Lanka, brushing aside opposition from the people of TN and the state government. Today, as a result of this, more than four hundred fishermen from TN were killed and thousands were arrested and tortured and their fishing boats, nets and other equipments worth millions of rupees were destroyed by the Sri Lankan navy. Hundreds of protests and strikes by the Tamil fishing community and appeals from different sections of the people and all political parties to take necessary steps to protect the fishermen were simply ignored by the Indian government on the pretext that these fishermen are conduits for the LTTE. This article is part 1 of a 2 part series. This article was originally published in People’s Truth #7. Thanks to Banned Thought for making it available. On 18th May 2009, the president of Sri Lanka Mahinda Rajapakshe declared that the three decades of war against the LTTE has come to an end. He declared that the Sri Lankan army won a final victory against the Tigers. The Sri Lankan army and the government also claimed that the LTTE leader Prabhakaran and many of his lieutenants were killed in the battle and showed the photographs of the dead body of Prabhakaran in the electronic and print media. On 20th, the Sri Lankan government declared a national holiday to ‘celebrate’ this ‘victory’. The timing of this declaration created suspicion amongst the people who are closely watching the developments in Sri Lanka, in India and all over the world. It appears that the Sri Lankan government deliberately spread this news after the announcement of parliament election results in India. While the Sri Lankan government and the UPA government led by the Congress party celebrated this, millions of sympathizers/supporters of Tigers and Eelam struggle all over the world were shocked in disbelief that the struggle for a separate Tamil Eelam would come to such an end. Within 24 hours, the Tigers rubbished the Sri Lankan government’s claim and published that the Tiger’s chief and many leaders of the LTTE are safe and the struggle for Tamil Eelam would continue until realizing its goal of achieving a separate homeland for the Eelam people. Tamils all over the world held protest demonstrations, and in Tamil Nadu (TN), some violent incidents also took place. 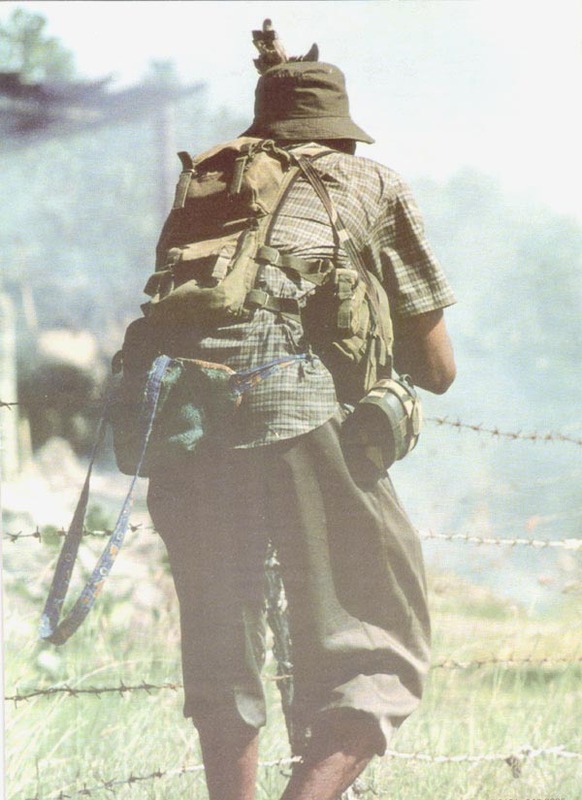 Although the claim by the Sri Lankan government that they have achieved a conclusive victory over the LTTE and the armed struggle for a separate homeland for Eelam can be disputed, at least for the present, there is no doubt that the Sri Lankan army achieved a major military victory over the LTTE. How could one of the most powerful guerrilla forces, the LTTE, have faced such a defeat and how was the Sri Lankan army able to inflict such a defeat? With this defeat, whether the three and half decades of armed struggle for self-determination come to an end? Whether the Sri Lankan government will fulfill the genuine national aspirations of the Eelam people? Whether the Tamil people in Sri Lanka can live as equal citizens along with the Sinhalese? What will be the future of Tamils in Sri Lanka? These are the important questions for all those who fight for freedom, national liberation and for people’s democracy and those who genuinely support the cause of Tamil Eelam. To understand the struggle for Tamil Eelam it is necessary to look into its origin and its growth. 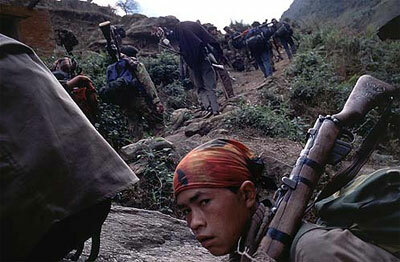 FromAl-jazeera.. a reactionary, pro-government, anti-Maoist report. But interesting nonetheless. It includes a call for the Indian state to reassert power in the growing liberated zones within India. Thanks to D for making us aware of this. The previous articles leading up to this one are available here and here. We are breaking this post into three parts because of its length. This is part 3. Part 1 and part 2 are available here and here. This piece is based on an interview which was published in the Biplabi Gana Pratirodh, the mouthpiece of Gana Pratirodh Mancha (Forum for People’s Resistance) in its June 2009 1st year no.3 issue. It was taken, as we learn from the editorial note, before the results of the Lok Sabha elections were declared. The interview covered many aspects of which we have taken only those which are relevant for our purpose. This is the only piece available at hand till now where we could get an idea of how the Maoist leadership has assessed this historic struggle. Some portions of the text, I feel, need clarification. However, in view of the overall present situation, it is next to impossible to get any direct access to him. So we are keeping the text exactly as it was published in the periodical. This is a free translation from the Bengali original. Nepal: PLA Preparing for Revolution? KAILALI, Aug 17 – Maoist combatants cantoned inside the seven camps across the country are losing hope of joining the natio-nal army since the government led by their party UCPN (Maoist) stepped down. This is especially true among Maoist fighters inside Lokesh Smriti Brigade of Badaipur under the seventh division camp of People’s Liberation Army (PLA). They have been asked to wait for transformation and peace, and at the same time remain alert against regressive forces. The soldiers are being told of the possibility of both war and integration at the internal training for PLA fighters inside the camp. Of late, guerrilla warfare has dominated the regular exercise session inside the camp. Thanks to D for making us aware of this. The previous articles leading up to this one are available here and here. We are breaking this post into three parts because of its length. This is part 2. Part 1 is here and 3 will be available soon. With central and state police forces engaged in this totally unjust war against the people, occupying about 14 school buildings. About 20,000 students have been affected as the schools have been shut down. Nobody knows for how long this situation will continue. Of these, five schools are situated in Midinipur Kotwali police station area while the rest are in Lalgarh, Jhargram, Salboni and Goaltore areas. The occupation of schools by occupation forces has resulted in strong resentment among students, their guardians and teachers. The students of Mohandas Vidyapith in Medinipur even staged a demonstration. A group of students and their guardians also demonstrated outside the district inspector (DI) of schools’ office demanding that the police camps be shifted to other places. But the DI expressed his helplessness as the acquisition of the schools is an administrative decision. Leaders of the Medinipur Suraksha Committee staged a dharma outside the office of the district magistrate on 26 June over the same issue. Students of Class V to IX of these schools could not appear for the unit tests which were to begin on 26 June. In all, they have to undergo five such unit tests before the annual examination and three before the pujas (annual social/religious festival of the Hindus) which had been pre-poned this year. 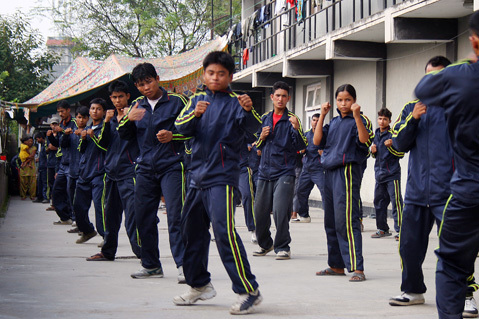 Besides, the academic session in the state has also been advanced by two months. Thus this loss of time would give them lesser time for preparation. Thanks to D for making us aware of this. The previous articles leading up to this one are available here and here. We are breaking this post into three parts because of its length. This is part 1. Part 2 and 3 will be available soon. We are bringing out this Update 2 which is in continuity with our earlier Update 1 (published in June 2009) to the original booklet: Singur to Lalgarh via Nandigram Rising Flames of People’s Anger against Displacement, Destitution and State Terror by Prof. Amit Bhattacharyya. He has quickly put together these two updates as the people’s struggle in the Lalgarh-Jangalmahal region of West Bengal is unfolding into a historical uprising with very many new creative forms of dissent. Encouraged by a great response from various sections of people from all over India in receiving these booklets, we are publishing the Update 2 quickly. We are also encouraged to see the translation of these booklets into various languages like Oriya, Telugu, Tamil, Malayalam, Hindi, Punjabi etc. 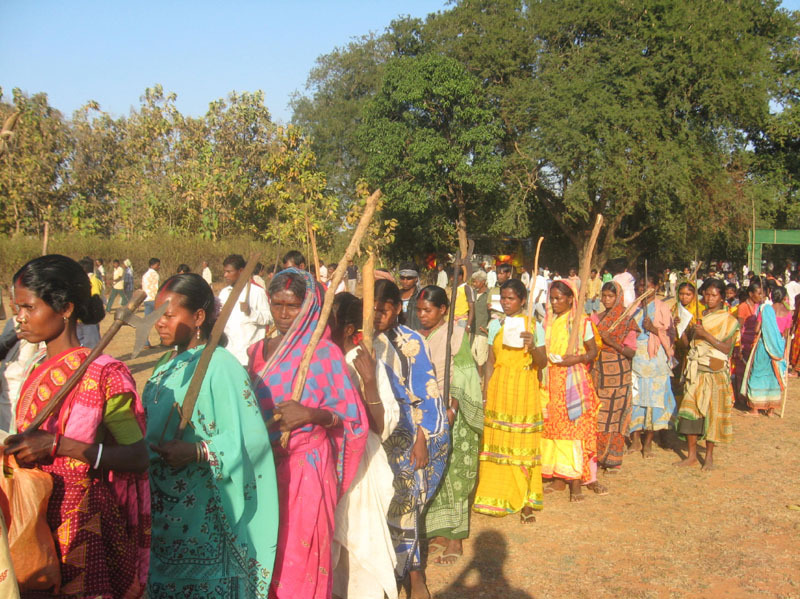 What started as a struggle in November 2008 against displacement and police atrocities in Lalgarh has now acquired manifold dimensions of a larger people’s struggle. 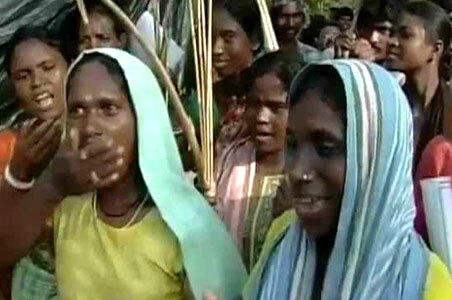 Keeping in view the significance of this people’s struggle, we are placing these updates before the people in struggles or those who are interested in people’s struggles at a time when media coverage of the developments in Lalgarh has dwindled to two-line news items or literally no coverage outside West Bengal. We hope this Update 2 will give an idea of what is going on in Lalgarh-Jangalmahal, though by no means it is a comprehensive report as no outsider is allowed by the West Bengal and Central Governments to go to the area of struggle to have a firsthand knowledge. This article comes from People’s Truth #7 posted on Banned Thought. Thanks to D for bringing this to our attention. 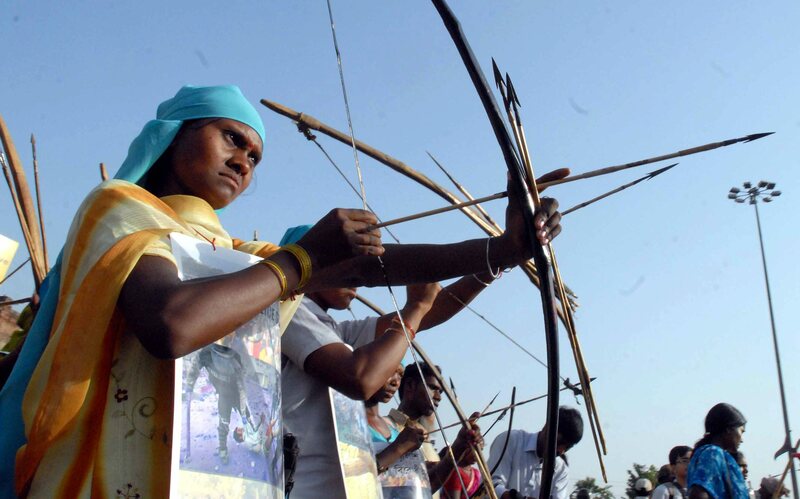 What has been taking place in Lalgarh during the mid-June period was a festival of the masses. It is a festival the like of which was not seen anywhere else in our country for a long time. People who had been oppressed and humiliated for a long time have stood up with arms, with their heads held high like a mighty storm and are attacking their enemies, and destroying their property, annihilating the most hated among them. The CPI (M) leaders and cadres–the most trusted stooges of the ruling classes, the revisionists and most notorious of the reactionary elements have been rightly identified as the main enemies of the people and they are being dealt crushing blows with ferocity. Never in the wildest of dreams could these enemies of the people think that they would be reduced to such a fate in a state where they had been lording over for more than three decades with sky-kissing arrogance. 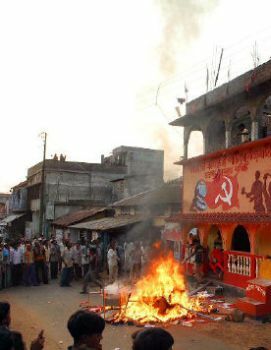 The heroic people of Lalgarh have targeted those symbols of power—the most hated CPM leaders and goons, those social fascists, their party offices and property. It was a scene worth beholding. Thanks to Comrade Alastair for bringing this to our attention. This article was published on Nepal News. Even after three years of joining the mainstream politics by renouncing war, the Unified CPN (Maoist) has not returned properties of about 30,000 families in 72 districts, a parliamentary committee formed to monitor the implementation of Maoist commitments has concluded. The tenure of the committee itself has ended on July 22. The committee had published public notices seeking information on confiscation of property. It received thousands of applications in the District Administration Offices of 72 districts, according to the committee. No applications were received in Manang, Mustang and Dolpa. The Maoists have only returned properties belonging to Rastriya Janashakti Party chairman Surya Bahadur Thapa, UML leader Amrit Kumar Bohara and former Chief of Amry Staff Sachit Shumsher Rana.